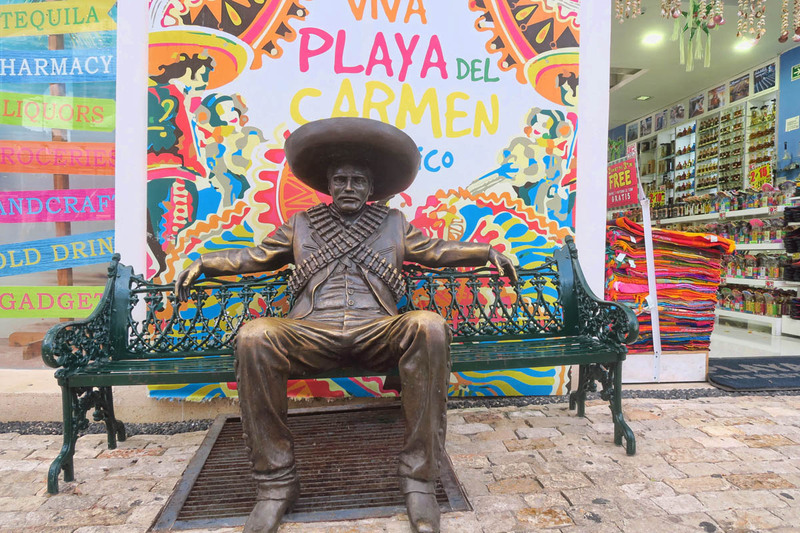 The title of this blog sounds like something from Burning Man, when in fact, it’s about another “sleepy little Mexican town” turned into a rockin’ tourist enclave. Wow! How the Playa has changed! 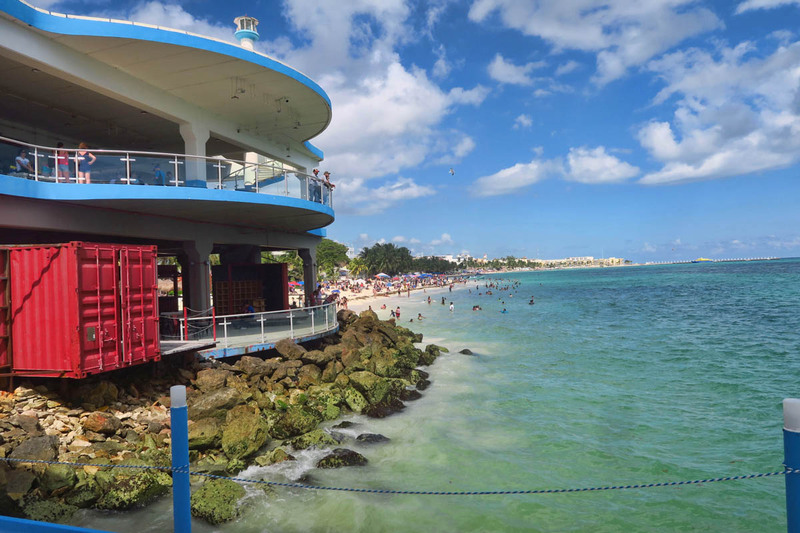 Playa del Carmen’s only claim to fame used to be the ferry that connects Cozumel to the mainland. Now, it has become a vacation destination in of its own. And at the heart and center of that destination is a full blown circus, complete with costumed Mayan warriors, aerial acts, jugglers and junk food. Costumed dancers perform beneath this mermaid arch. 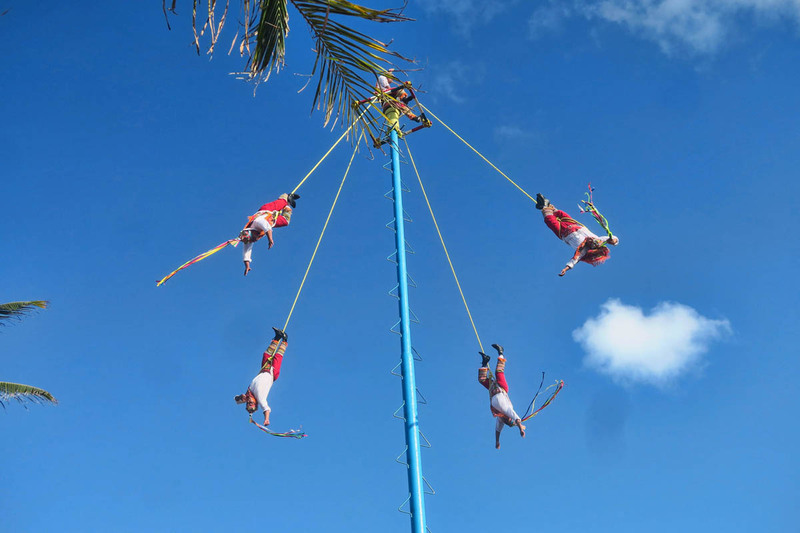 This ancient Mesoamerican ceremony, “Danza de los Voladores,” or Dance of the Flyers takes place in the main square several times per day. Ironic that the main drag in Playa is called “Fifth Avenue,” as some shops along the Avenue almost live up to the name’s reputation. Fifth Avenue is a three mile street chock-a-block with restaurants, shops, and bars. 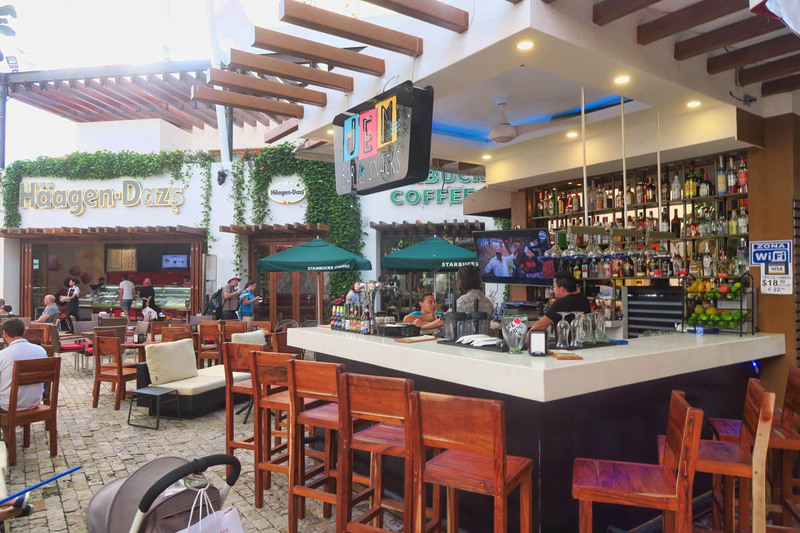 While there is certainly a lot of “entertainment value” to today’s Playa del Carmen, it’s not for me. 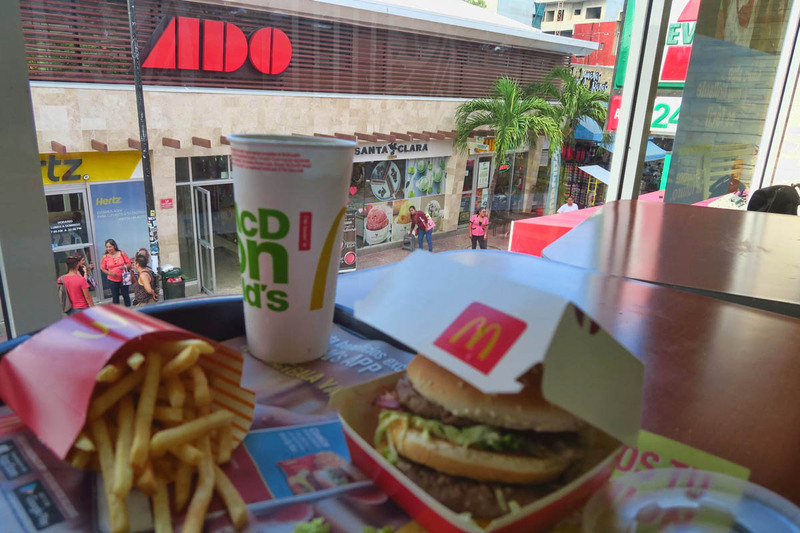 I am grateful to be here in transit only, not having paid hundreds of dollars for a beachside vacation to “get away from it all.” Too congested, too commercial, too gentrified with Starbucks, Haagen Daas, and McDonalds…though I do confess to being a hypocrite where McDonalds is concerned. After two months of tacos, beans and rice, I succumb to the “Walk of Shame” to eat a Big Mac. It’s the closest thing to “a little taste of home,” and my go-to comfort food after long periods on foreign soil. But with “progress,” also comes greater access, which is why I am here…to leave. It’s never been easier to get in and out of the area, as ADO bus lines now has a terminal located right on Fifth Avenue, the “main drag,” only a couple of blocks from the ferry terminal. For ten bucks, this comfortable air-conditioned bus goes straight to the Cancun airport. I hang my head in shame but in fairness, I’ve been eating tacos for two months now. Besides, it’s right across the street from the ADO bus station! It’s a very popular novelty for street performers to spray paint themselves bronze, and sit on the bench to scare the tourists who think they are bronzed statues. This bad hombre is the real deal, however. 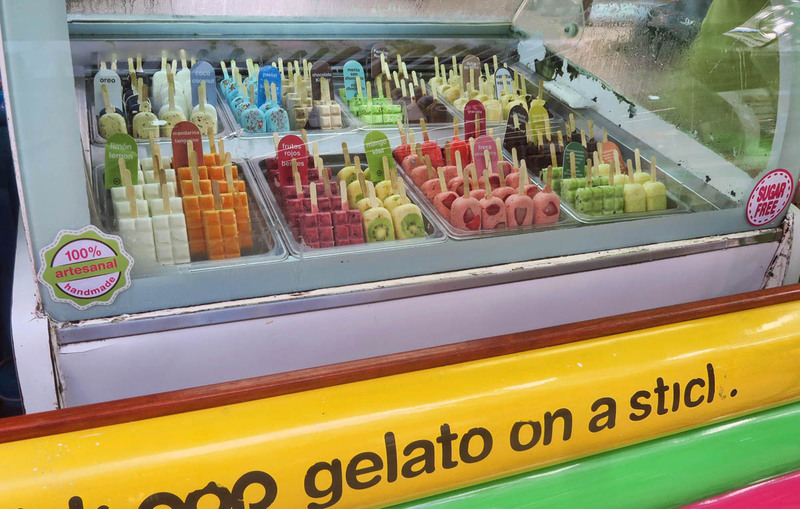 One thing you can always count on finding in Mexico is good ice cream. Sad to see this strange trend of flesh eating fish pedicures, where fish in foot baths eat the dead skin off people’s dirty feet. So many things wrong with this, including inability to disinfect between customers. Get a loofa, and leave the fish in the ocean as food for the bigger fish! If you like to drink your dinner, this is the place! Those green barbell-looking things on the bar are cocktail glasses to hold the frozen daiquiris behind the bar. 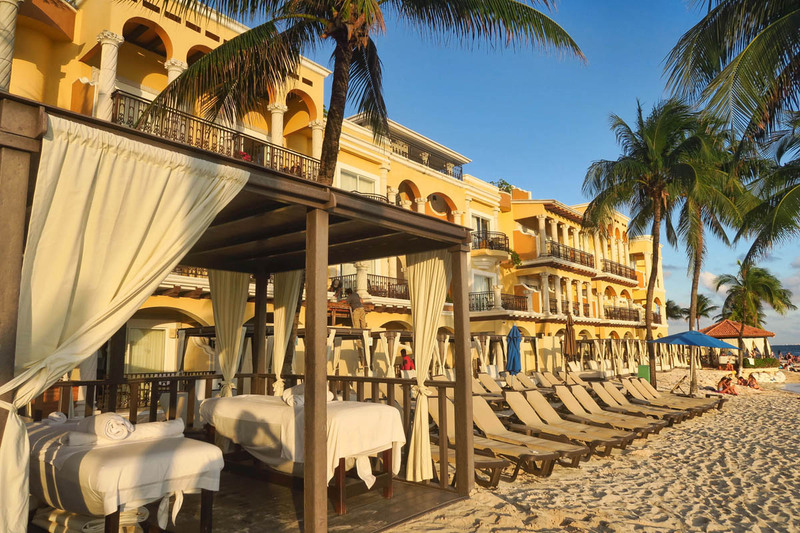 This resort is beautiful, but has a front row seat for the circus. 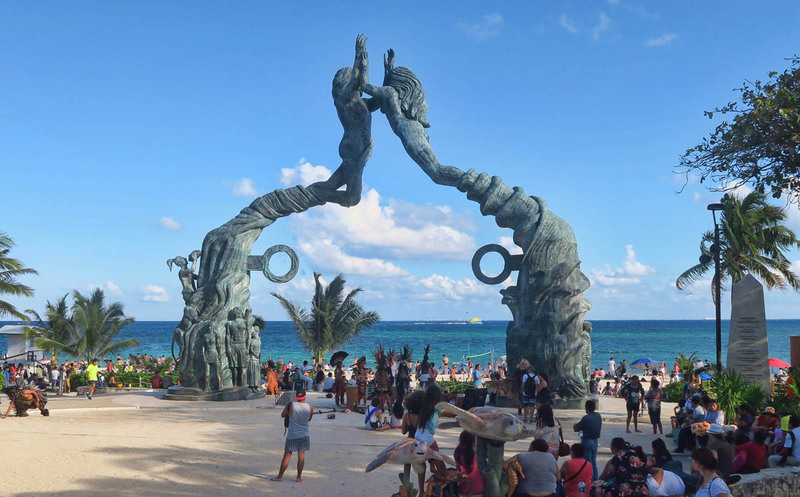 Playa del Carmen is my last stop in this giant fish-hook shaped journey from border to Mexican border. 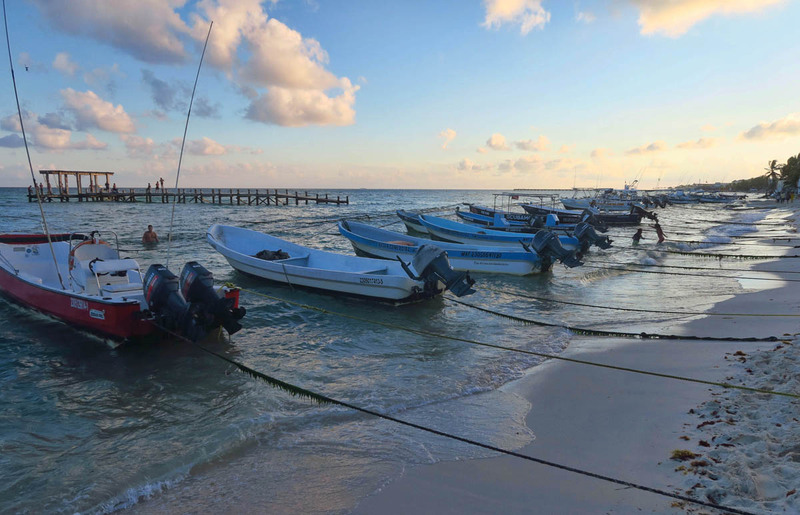 My route has taken me on eight scenic bus rides and two ferries (four if you count Caye Caulker) through mountains and villages, along lakes and rivers, into the jungle and archeological sites. 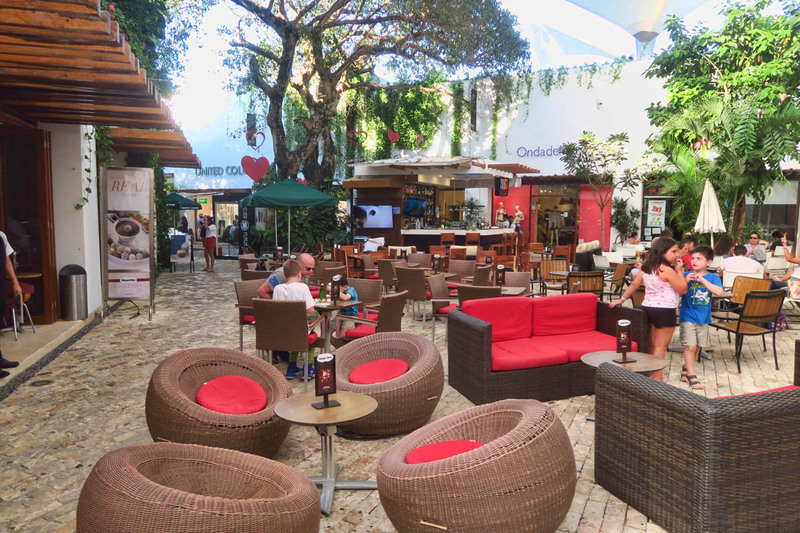 Only one bus ride remains, an early morning departure to from Playa del Carmen direct to Terminal 2 at Cancun Airport where I will board my American Airlines $192 flight to Quito, Ecuador. It feels a bit surreal to arrive at the Cancun airport from Texas without having gotten on a plane. Next up….What goes up 30,000 feet, but only comes down 20,700 feet, as I visit the highest capital city in the world. 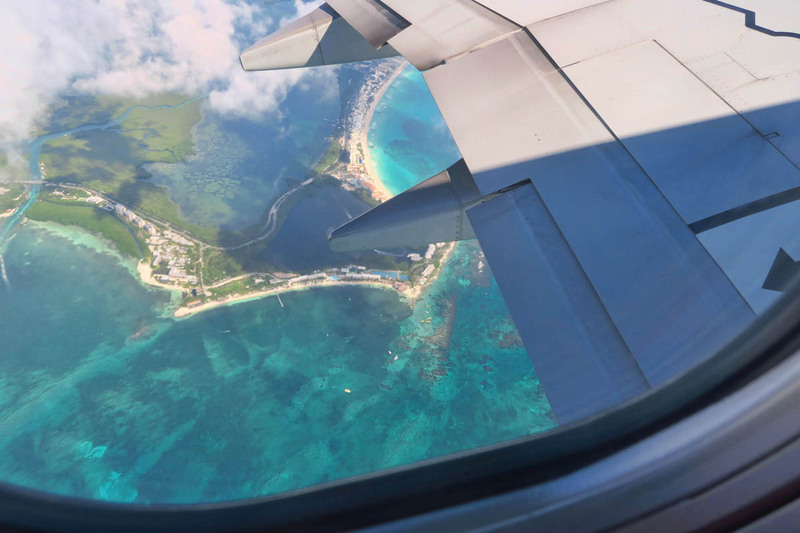 Looking down on Cancun’s white sand beaches. Adios, Mexico! 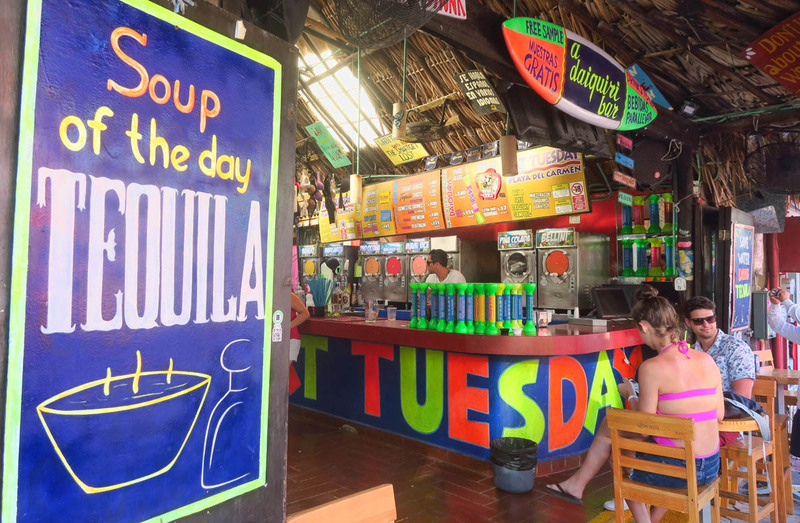 This entry was posted in Mexico and tagged Playa del Carmen by Suzanne. Bookmark the permalink. 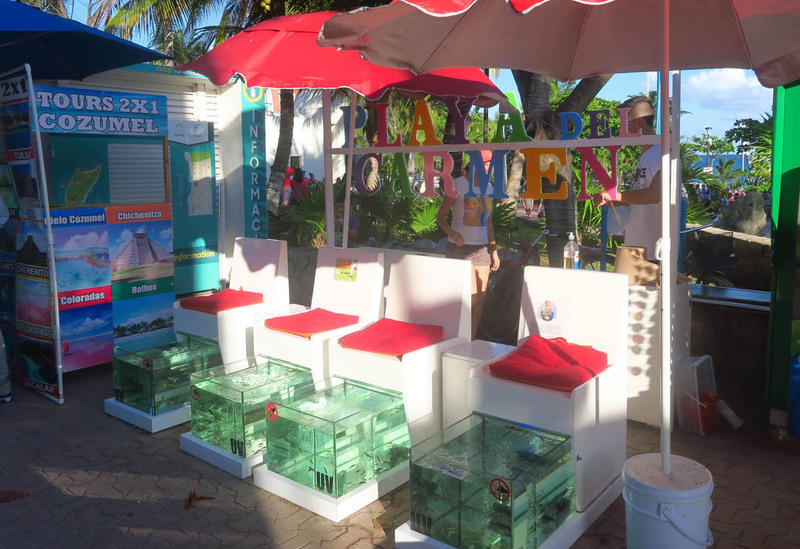 So fun traveling through Mexico via your blog posts. Looking forward to what awaits in Ecuador! Twas thinking the same thing! Looking forward to Ecuador! I was fine until I got to the flesh eating fish pedicure! Perhaps I shouldn’t read your blog while eating lunch!!! 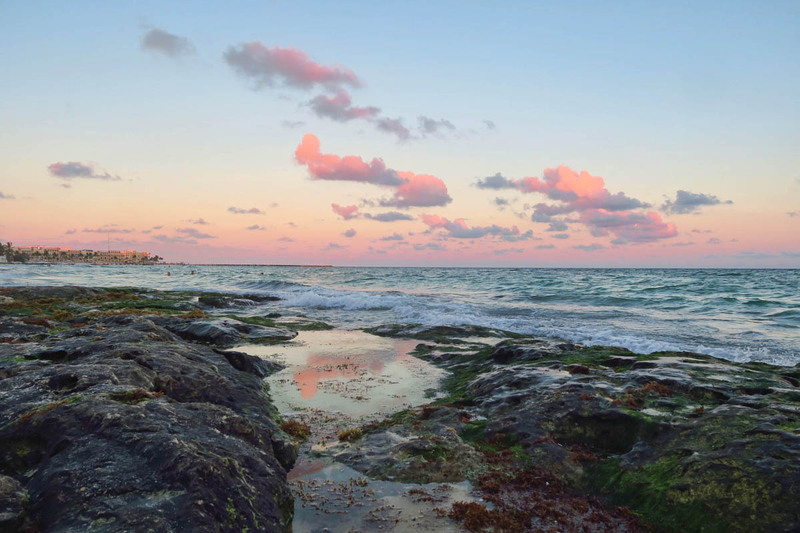 Your blog confirms for me why we stay inland when in Mexico. Sad to see what passes as ways to attract tourists to a sleepy little town. You would think the beaches and color of the water would be enough. 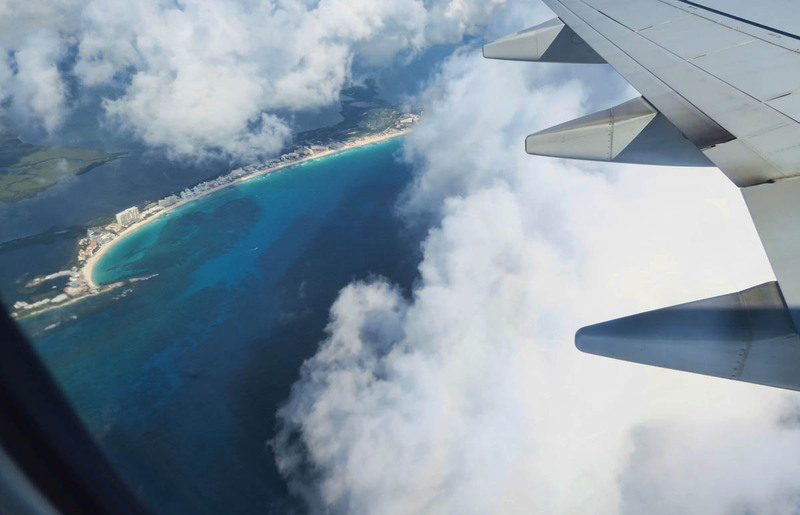 So envious of your adventures! Although we don’t go to McDonald’s a lot, we do crave it after being in the remote Canadian wilderness for a few months! So sad. Used to be such a beautiful area.